Mirage of Blaze | Anime With A Side Of Sarcasm! Don’t quit know where to begin with this one. I wasn’t super bad but it was most definitely not great. This is another anime where its been tough to get through the all the episodes. Its only 13 ep, I started watching it about 4 months ago and STILL havent finished it yet. That’s how much interest I have in it. The main story is about these people that are the reincarnations of old feudal lords whom are drawn together in this era to fight this never ending battle that started in the feudal underworld. This part is interesting in the fact that it really brings a sense of history in the anime and plays out as a modern day magical war against lords. Where it loses my interest is the fact that the scenes are sooo freakin drawn out. Like drawn out over multiple episodes and it is all about one thing that they never seem to move forward on. 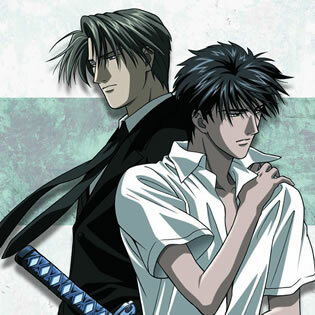 This story also involves a shōnen-ai plot line between the two main characters Takaya (vessel of Kagetora Uesugi) and Yoshiaki (Nobutsuna Naoe) who in their past lives were extremely close and Nobutsuna was in love with Kagetora. This causes some tension between the two throughout the show as they struggle not only with the awakening and warring lords (vessels) but their relationship and trying to make sense of it in this current era. In addition how their relationship plays into this war. Normally I have no problem with shōnen-ai in anime but in this one it just made the plot line WAY more confusing then it needed to be and the love story dragged on and on and on but not in a cute way like in say Baka And Test. Either you like him or you don’t. Please don’t sit for 13 episodes and act like the whole thing is killing you and not make any effort. For real.